Have you heard of Surgent EA Review? It’s one of the most exciting offers for supplementary practice questions. Searching for a Surgent EA discount? We’ve got the latest Surgent EA discount, and you can get the code here! It’s a new brand on the market, but the underlying technology has been around for 20+ years. Let’s take a look and see why they deserve a 5 star rating. Disclosure: The I Pass Team may earn a small amount of compensation if you purchase from our links; our team uses these revenues to maintain the site and produce awesome free content just for you! 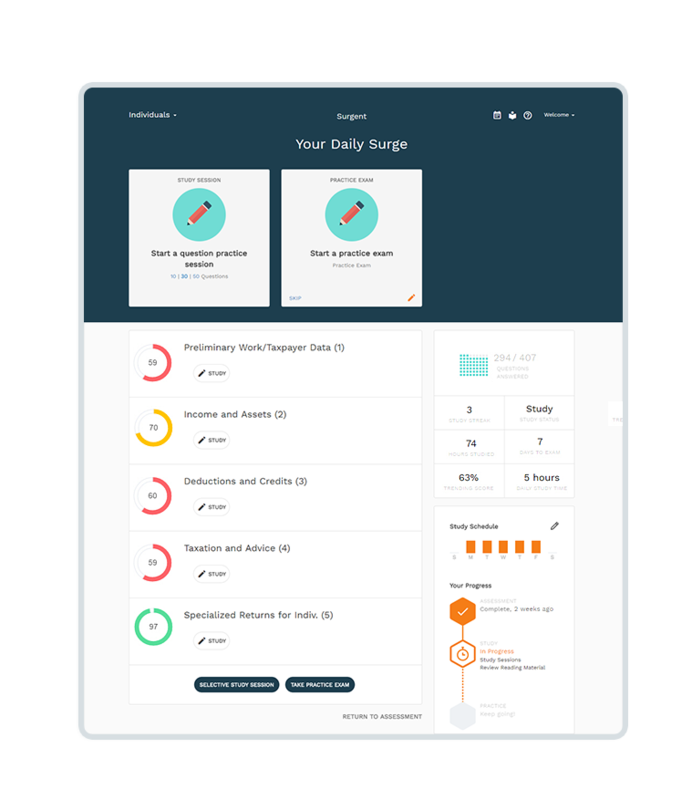 The Surgent EA review runs on a system with “Adaptive Learning Technology”, meaning that the system is able to identify students’ weaker areas, and feed them targeted questions on those particular subjects accordingly. As I mention throughout this site, you don’t need to keep studying what you have already mastered because to do so would be inefficient. Instead, you can use an efficient technology so that you can add more points to your score by strengthening the areas on which you need the most help. This is the #1 reason Surgent customers choose this course. The goal of this technology is for you save more time and energy to focus on the weaker areas (and this is where you’ll see your scores picking up a lot of points)! Because of this, Surgent is likely the most efficient test prep you can get on the market. This pass rate hasn’t been verified by a third-party, but it is an impressive number for sure. I especially like the free trials because nothing is more solid than giving us the opportunity to try it ourselves. It also shows the confidence Surgent EA’s team has for their products. While I believe the tool is great for everyone, it is especially helpful to those who fail the exam. The system helps identify your weaker areas, which is exactly what you need to do to pass in the next attempt. Although Surgent claims that you can prepare and pass the EA exam with their questions alone, it seems most candidates are still more comfortable with a textbook or some sort of studying materials. This is not available at Surgent at this stage. At $499, the price is hefty no matter how you look at it. If you do weight this feature heavily in your decision-making process, the time and effort saved during your studies could greatly outweigh the higher price tag. Also, as I mentioned earlier, the Surgent EA offering is a test bank, not a full course. Because of this, I think this offering lacks some of the value that the other courses afford. To save yourself some money on your EA review, check out the EA course discount page and find an offer that can help to offset the costs of exam prep. Surgent EA review has an overall pass rate of over 80%. This means that more than eight out of ten students pass, which sounds pretty good to me.